Gym and health club members across the US are to get a personalised mobile experience that uses both NFC and Bluetooth LE thanks to a new deal between Outcast Fitness, the US’ largest health club digital media network, and NFC marketing specialist Blue Bite. 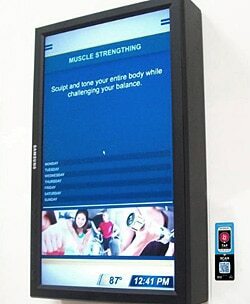 Blue Bite’s mTag platform will be used to provide members with “a combination of advertiser content as well as club-specific information such as class schedules, trainer profiles, nutrition facts, workout suggestions and other helpful tips,” when they tap an NFC tag or scan a QR code mounted next to Outcast’s screens. The platform will also use Bluetooth LE geofencing to allow gyms and content providers to target audiences by sending user-specific information to an individual based on their preferences. BLE beacons will also be used to allows consumers to automatically check in as soon as they enter the gym, simplifying the signing in process. “This deployment highlights our belief in a holistic mobile approach with a focus on consumer experience and flawless execution rather than a specific technology,” adds Mikhail Damiani, CEO and co-founder of Blue Bite.